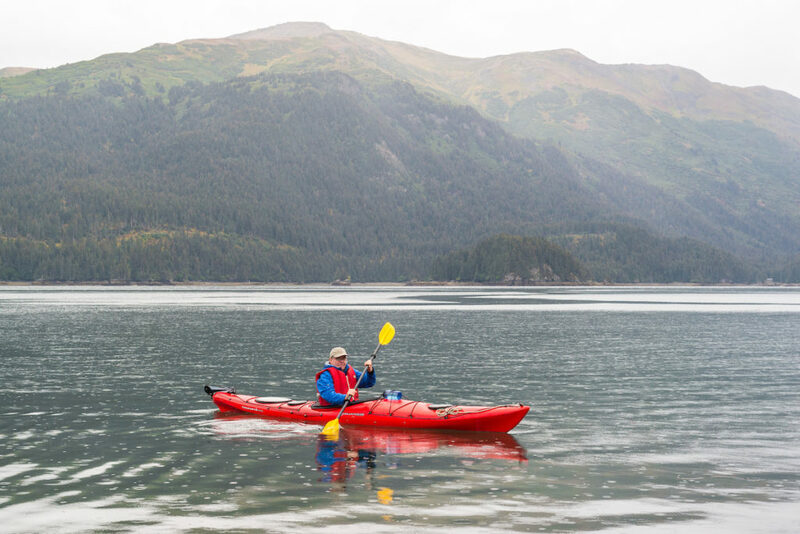 Kayaks, glaciers, sea otters and remote cabins: let’s call it love at first sight. 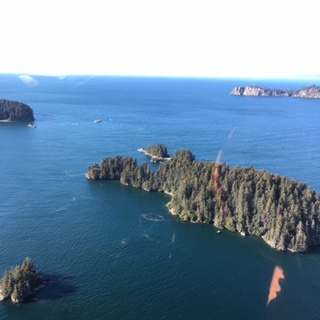 From the moment I spied Tutka Bay from the floatplane – those dark waters, pine clad islands, a backdrop of mountains and a glacier in the distance – it had me. The topography looks like coastal Maine on steroids (but virtually unpeopled), set against a backdrop of the Swiss Alps. It’s a Bob Ross painting in real time, the coastal wilderness I’ve always dreamed about but never found in such perfect proportions. 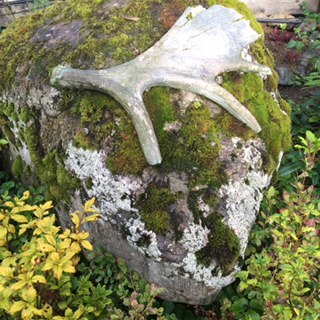 It lies at the entrance to a seven-mile fjord at the southern end of Kachemak Bay, across the water from Homer. The aerial arrival was spectacular, but then there was the lodge itself. 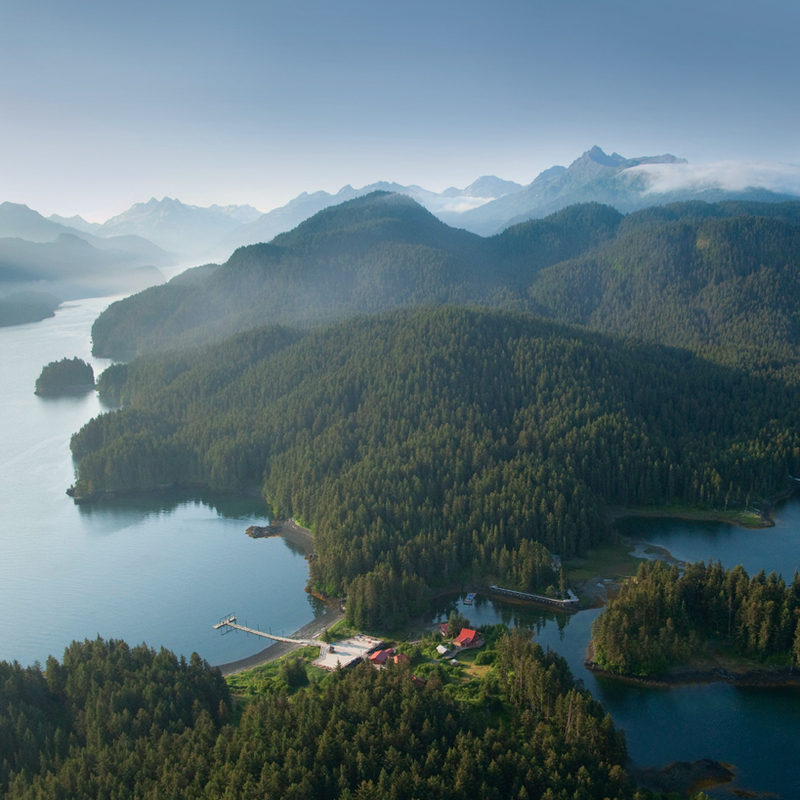 As the plane motors to the long dock, Tutka Bay Wilderness Lodge reveals itself slowly, theatrically. 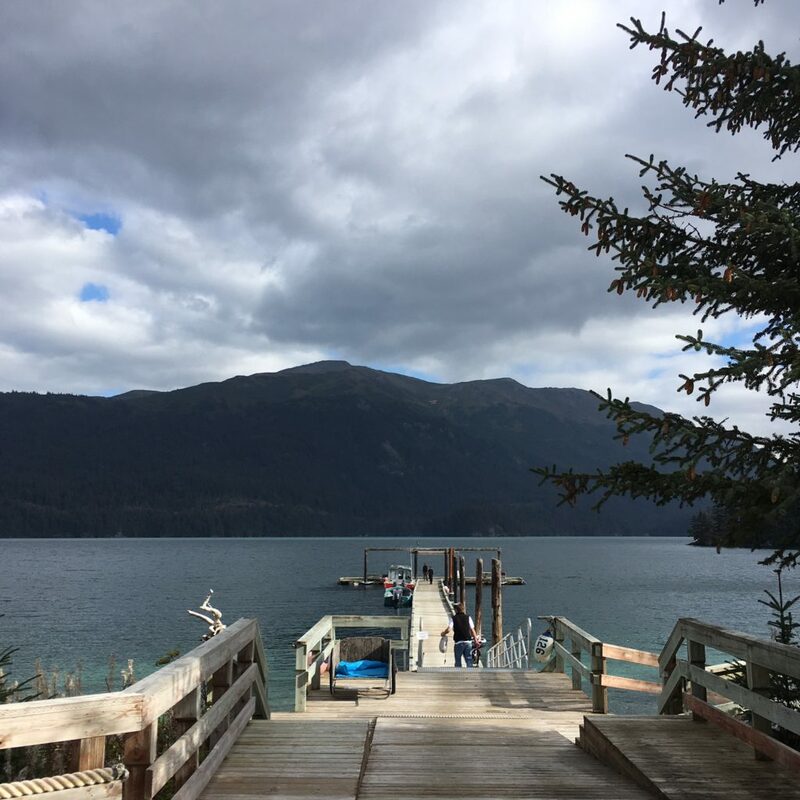 The guides heft your duffle bags off the aircraft and you walk up the dock to a vast deck, designed expressly for landing sightseeing helicopters or hosting a bacchanalian full moon celebration for the handful of lodge guests. Then the planking extends in a spider’s web of elevated wooden walkways –elevated because the tides here can reach 30 feet. You begin to see a few of the six cabins, peeking out of the woods, or arrayed off the walkways or pathways, none of them the same, all of them looking somewhat handcrafted. The small but welcoming lodge lies tucked up a rise, with a lounge and dining area and a beacon of Wi-Fi. 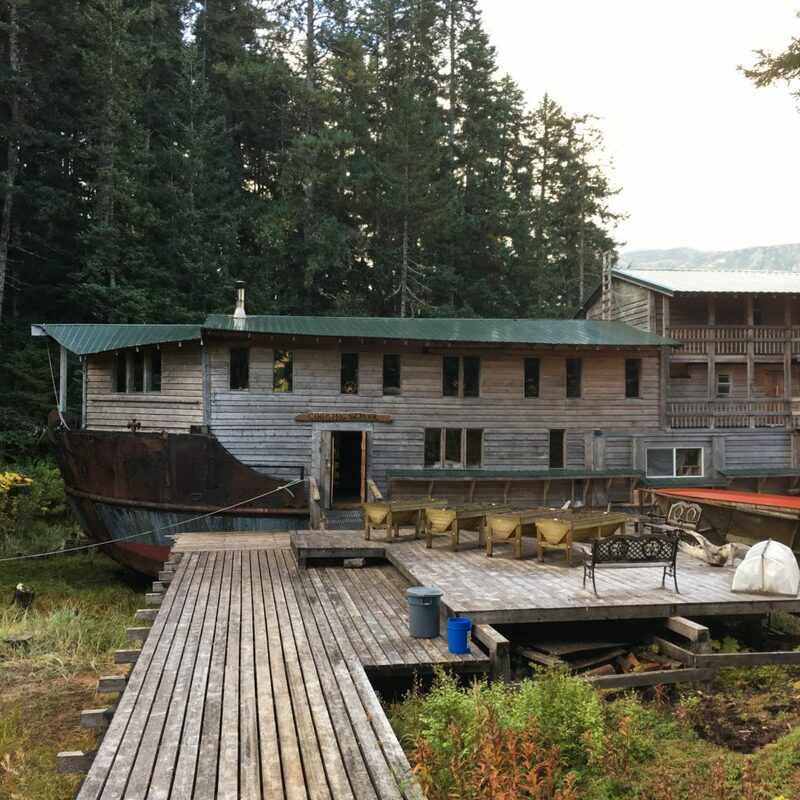 The most unusual building is a ship, Widgeon II, a re-purposed crabbing boat that was originally a World War II-era troop carrier. 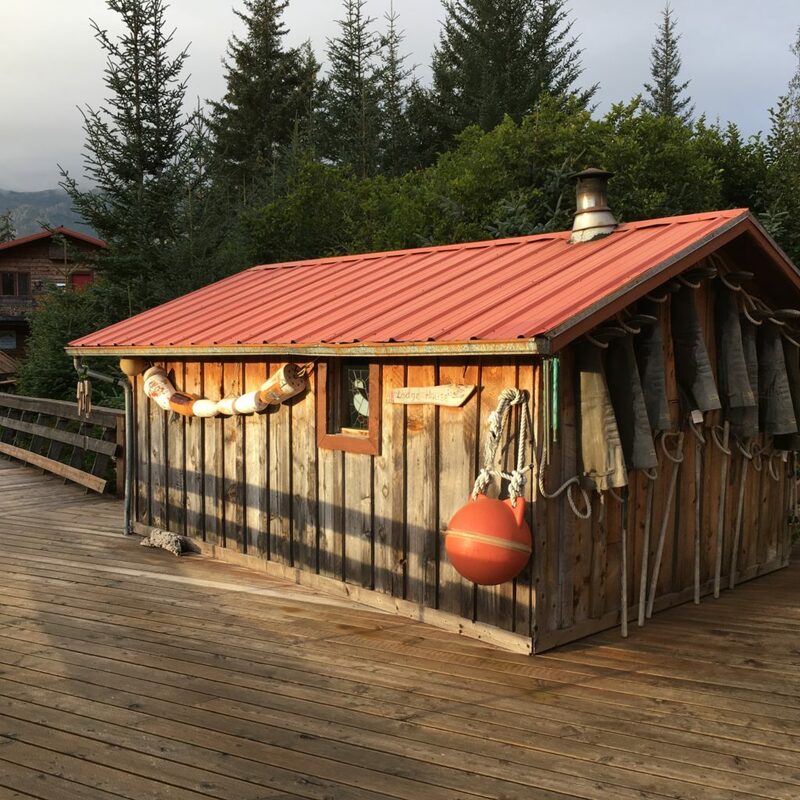 Located on a lagoon across from Tutka Bay Lodge, the boat was moored to shore during a high tide by a previous owner, who then built a two-story wooden structure onto the deck. 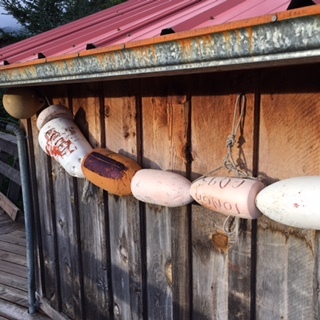 It’s not going anywhere now and has become the very rustic location of the Cooking School at Tutka Bay. 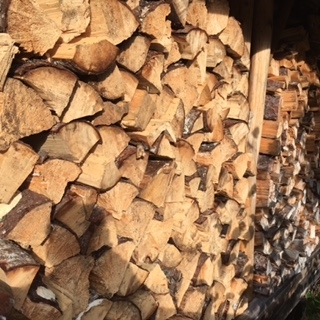 My favorite structure, easily spotted by the plume of wood smoke from a stove pipe, is the Russian-style banyan, a wood-fired sauna with a seriously hot stove that was always cooking, a thatch of birch branches at the ready for those who wanted a thwacking and the real Russian experience. 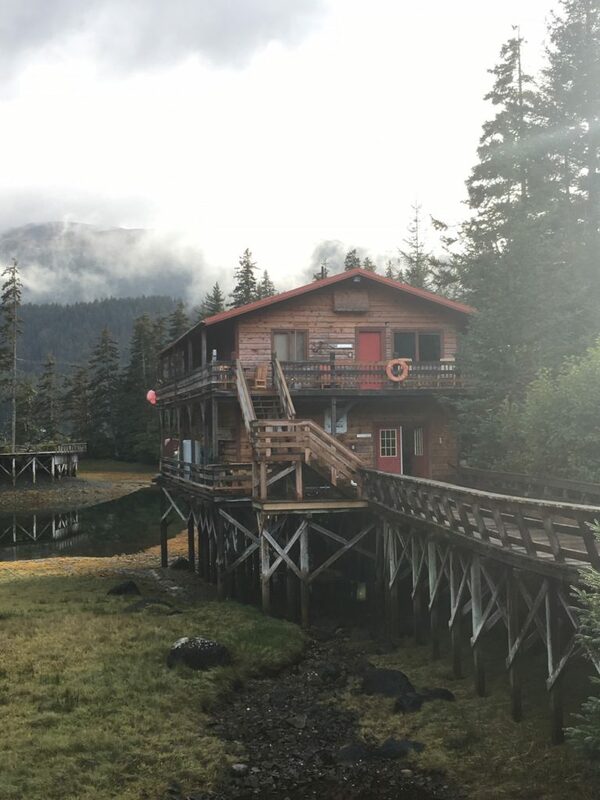 Tutka Bay felt less like a lodge than a little village perched on the edge of the wilderness. After an arrival lunch of excellent fresh salmon burger, I headed out sea kayaking. In a two hour paddle, I saw a bevy of bald eagles eating salmon on a beach, sea otters lazily paddling on their backs and then a spout of water, followed by the unmistakable site of humpback’s tail extending straight above the surface. It got better from there. There was the staff – led by the hyperactive and good-natured Gus, tempered by the quiet calm of Bri and Ben, abetted by the natural history savvy of Karen (above left). Their personalities large, their free spirits paired with the anticipatory service you might expect here. 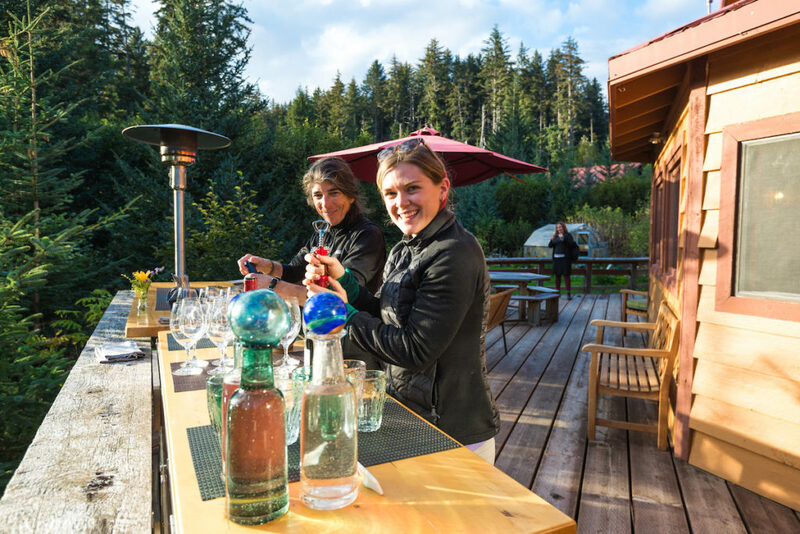 The ringmaster, in quiet control, was Carly Potgieter (above right), the charming and well-traveled daughter of Carl and Kirsten Dixon, who own Tutka Bay and their sister property, Winterlake Lodge, which lies north of Anchorage. 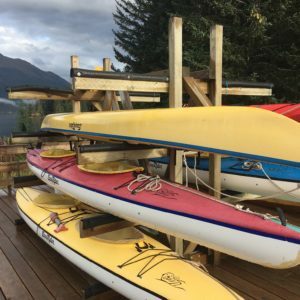 The Dixon’s have spent years as lodge owners and Kirsten has emerged as perhaps Alaska’s best known chef and cookbook author, who studied at Cordon Bleu in Paris and brought that discipline to the wilds. 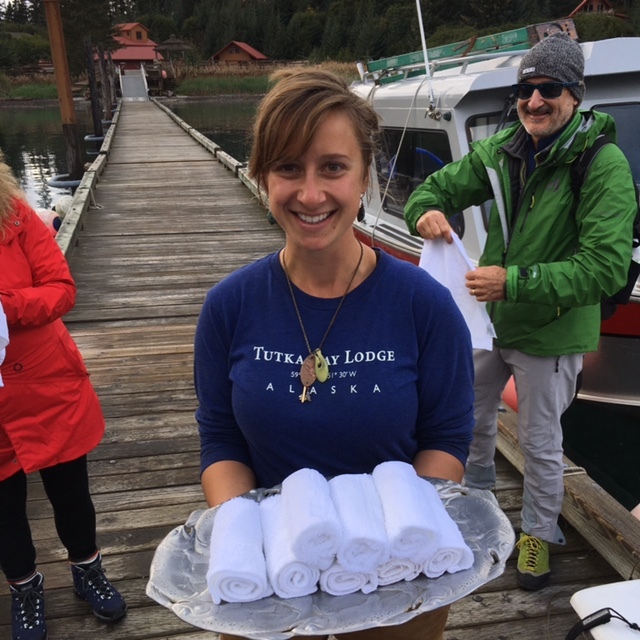 It’s her culinary vision that informs the meals at Tutka Bay. 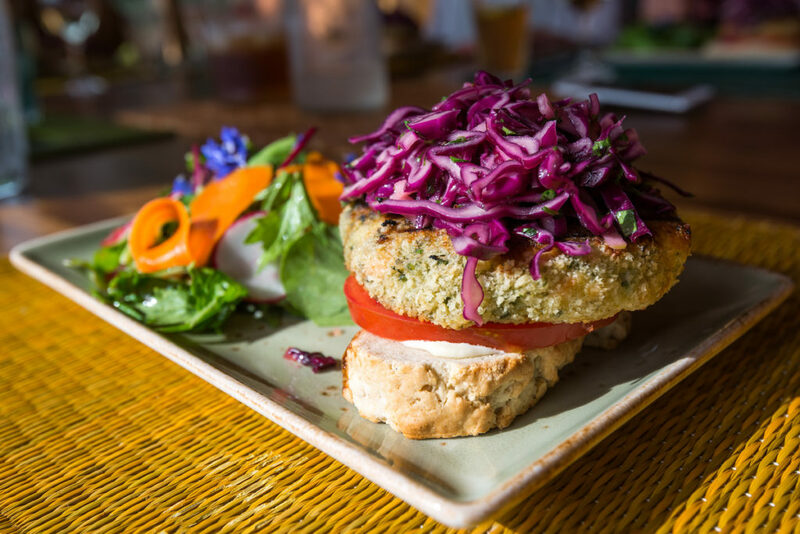 Each one is special, each one centered on a special dish, but also accommodating the dietary needs of any guests. 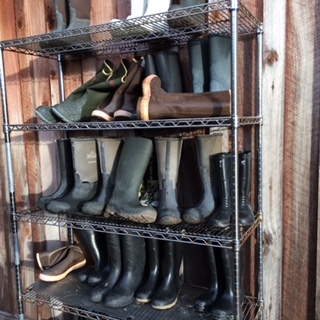 It’s the advantage of such a small lodge, one with such a high staff to guest ratio. Evenings began with cocktails on the deck, with hors d’oeuvres like halibut carpaccio, or smoked salmon cardamom spread. The cheeseboard presented at cocktail hour each night is from Manhattan’s legendary Murray’s Cheese, which arrives via next-day air. 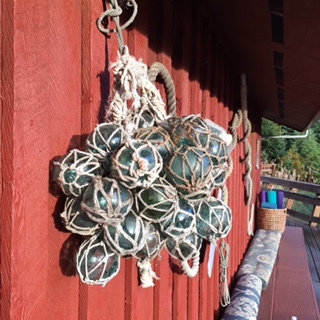 The multi course dinner – it might feature Alaska King Crab, smoked scallops or salmon as star attractions – was always artfully served, and frequently foraged, at least in part, from the woods and especially the shoreline, where the receding tide unveiled a cornucopia of edible sea creatures and an array of seaweeds and kelp. 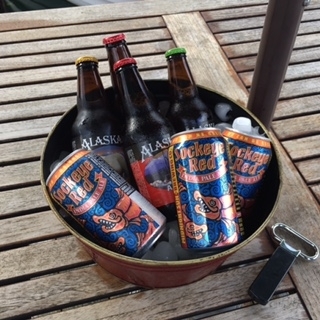 Wines from the Northwest and Alaskan Amber Beer made appearances. 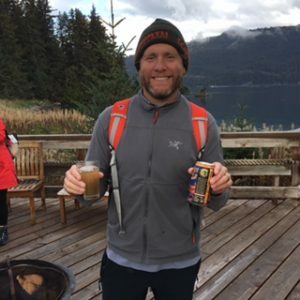 Jake Haupert of Evergreen Escapes, winding down after a long hike. 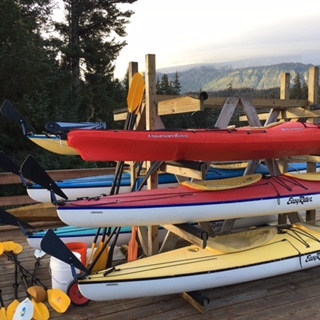 You can enjoy the outdoors in many ways, from pack rafting, paddle boarding and hiking to guided shoreline foraging followed by a cooking class. I went sea kayaking with Ben deep into the tidal outlet that is Tutka Bay. He’s an affable, knowledgeable and quietly capable guy, and pointed out the “termination dust,” Alaskan-speak for first snowfall, on the peak above the lodge. We paddled for about three hours before dragging our kayaks ashore and hiking through woods coated in iridescent green moss, a Dr. Seuss landscape, eating lunch by a remote lake. By the time we returned to our kayaks, which Ben had sensibly insisted we tie high on the shore, the water was lapping at their sterns and we paddled back for more than three hours against the incoming tide, surfing the waves. 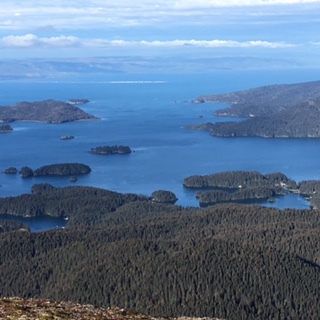 There were otters and harbor seals, and a shallow bay littered with the carcasses of thousands of spawning pink salmon, among them a few zombies aimless swimming along the surface. In the trees above us I lost count at 30 bald eagles, still as statues, clearly sated and digesting their morning feed. 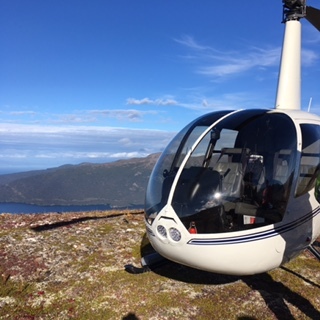 The day concluded with a helicopter ride to a nearby peak to take in the views. On the descent, we saw three black bears, scouring the tundra for dinner. There are a few places on earth that have such extraordinary Feng Shui and this is certainly one of them. 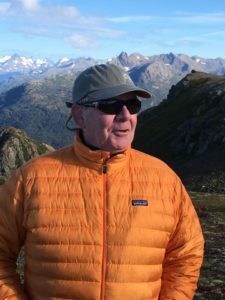 My well-traveled friend Kurt Kutay, founder of Wildland Adventures, was also there and referred to Tutka Bay as “sacred.” It’s not a word that I commonly use but here goes: it’s sacred, and it’s now in my pantheon of special places, which is a very rarefied place indeed. I’m already dreaming about a return visit. Talk about off the grid. This place looks amazing. Now I want to go to Alaska. 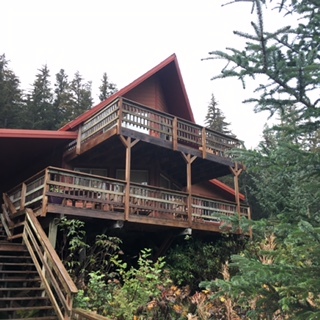 Tutka Bay redfines your ida of a "lodge."